Java has a lot of good things going for it. Without Java, we wouldn’t have Minecraft or Android. What’s more, Java powers scads of the interactive elements found on the Web. Just how far-reaching is Java? Its website claims that the tech is installed on 1.1 billion PCs and more than 3 billion mobile phones, along with each and every Blu-ray player known to man. But Oracle isn’t the only company benefiting from Java’s ubiquity. According to a new report from Soluto, a company that offers a remote troubleshooting tool for PCs and iOS devices, Java is directly responsible for a whopping 40 percent of its users’ installations of the uber-annoying Ask.com toolbar. ZDNet’s Ed Bott recently took a long and excellent look at the deceptive way the Ask toolbar hitches its wagon to Java, but it boils down to this: Every time you install or even update Java, the procedure prompts you to both install the Ask toolbar and switch your browser’s default search engine to Ask.com, which is stuffed with ads and far less useful than Google or Bing. Soluto reports that 59 percent of all users who install the Ask toolbar end up disabling it. 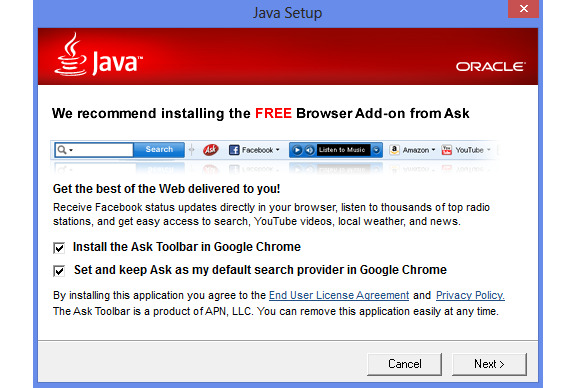 Worse, the Ask toolbar option is enabled by default when you’re installing or updating Java—you have to actively uncheck the boxes to prevent your computer from filling up with Ask’s sneakware. Few people change their software’s default settings, and Soluto says that nearly a full third of its users have installed the Ask Toolbar at some point. Soluto’s blog post doesn’t provide hard metrics about installation numbers; I’ve asked for more details. But that’s not all! The Ask software engages in some extremely sleazy practices if you do accidentally install it and want to eradicate it. Spyware expert Ben Edelman found that the Ask.com toolbar delays its installation until 10 minutes after Java is up and running on your computer, presumably to stymy efforts to immediately wipe the sneakware from your PC. And if you manage to uninstall the Ask toolbar, you still have to manually change your browser’s hijacked search settings—and possibly your homepage— away from Ask.com. Soluto’s data backs up the theory that few people really want to install the Ask toolbar on their PC. The company reports that 59 percent of all users who install the toolbar end up disabling it. “We believe most of the remaining 41% simply haven’t gotten to it yet,” Soluto’s blog post quips. But while news of Java’s plowing the path for Ask.com on billions of PCs around the world is disheartening, fear not: There are ways to fight back. First and foremost, this serves as a reminder to check the permissions that software asks for when you’re installing it. Seriously; don’t just frantically click “Next” over and over again. But even if you ignore that sage advice, modern browsers are wising up to the antics of sneaky extensions like the Ask toolbar. Recent versions of Google Chrome, for example, require you to give a manual thumbs-up to extensions enabled by third-party programs; Firefox offers a similar feature. Alternatively, you could just try to kick Java to the curb completely, which might not be a bad idea. Not only does Java attempt to foist the Ask toolbar on you with each and every update, but it’s also an all-too-frequent target for hackers, routinely falling prey to critical security exploits. 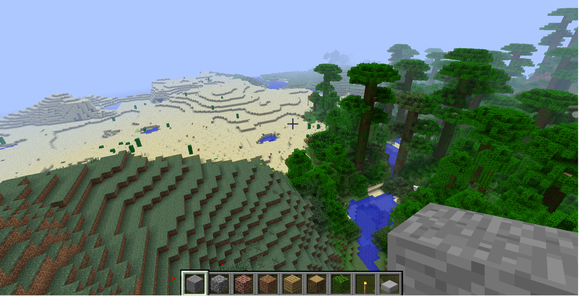 Minecraft relies on Java, but the vast majority of games and websites do not. While Java is absolutely critical to the applications that use it, only around 0.2 of websites actually do use it, according to W3Techs. When I attempted an experiment in ditching the exploit-prone Java, Reader, and Flash software earlier this year, I found that I hadn’t even installed Java on my PC nearly half a year after building it. Do you really need Java on your PC? You can say “Thanks, but no thanks” to Java’s incessant Ask toolbar installation attempts (and its security headaches) by uninstalling Oracle’s software completely. If one of your favored programs or websites—like, say, your bank—requires Java, you can install it again if you’re prompted. Chances are you won’t be.